This post should really be titled “how to plan a trip to Tulum in 5 days and while on a budget” but that title seemed to long! I planned a quick trip to Mexico that was worth the slight paranoia and many hours of research. We decided to skip Mexico’s party spot Cancun all together and travel deep into the jungle of Tulum. This last minute couples trip came together perfectly, with much to do and see. For less than $1000 per person you can make your way to Mexico, stay, enjoy excursions, and dine out as much as you want. We booked our flights 5 days before we left for less than $400 each. This is definitely a spot worth visiting more than once, think of it as a yearly quick getaway spot. We met many Americans who frequently escape to Tulum on the weekends or for short trips, just to refresh and revive, which is always necessary! This trip was all about unplugging and unwinding, so I didn’t post any photos on my timeline while I was away, except for a few quick Instastory highlights. These days in the land of “look at me” social media, we all feel the pressure to overshare. Often we forget that everything that we post on the internet stays, even if we delete it, forever! Think about it, when was the last time you went out to eat and actually talked about current events instead of scrolling your timeline and posting? Unplugging and unwinding is my new wave, much like the vibes in Tulum. We captured photos along the way to share later, still remembering the moment but living in it at the time instead. 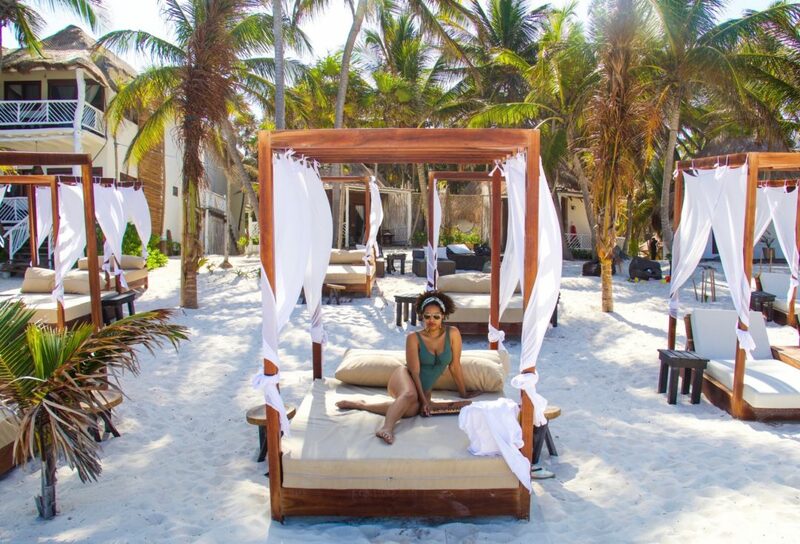 Take time to unplug and unwind and bring back some Tulum vibes from your future vacay! Situated off the Yucatan Peninsula, Tulum is a beach town 2 hours away from the main city and full of untouched nature and shoeless friendly restaurants. 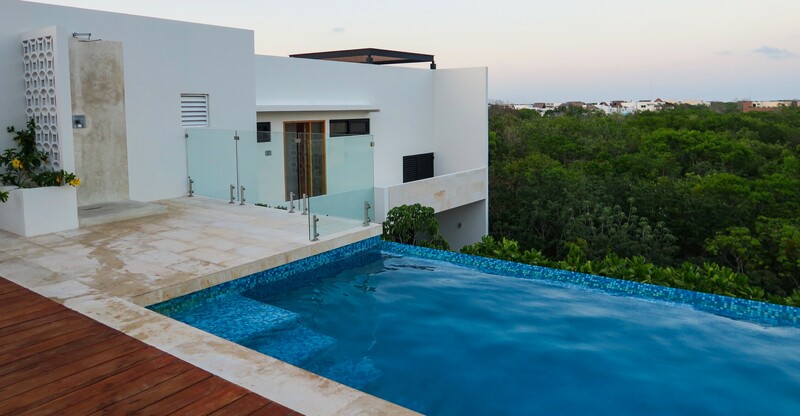 One of the last cities to be inhabited by the Mayans, it’s still being developed and travelers have been flocking to Tulum because of its’ accessibility and remote location. Buildings can’t be over a certain height and sand roads are more of the norm. If you’re looking for a real getaway, Tulum is the place where you can forget about any problems back home. Air Bnb has always been my best booking friend, especially for affordable and normally inaccessible lodging. We lucked up and stayed at the Highline Tulum, a boutique condo building with a gorgeous rooftop pool and authentic jungle vibe feeling. It’s about 15 minutes from the beach and uber quiet because of the remote location. The friendly staff will let you know exactly where you need to go and what you need to see. This apartment style set up is perfect for cooking on occasion, making your trip more affordable and giving you that “at home” aura. 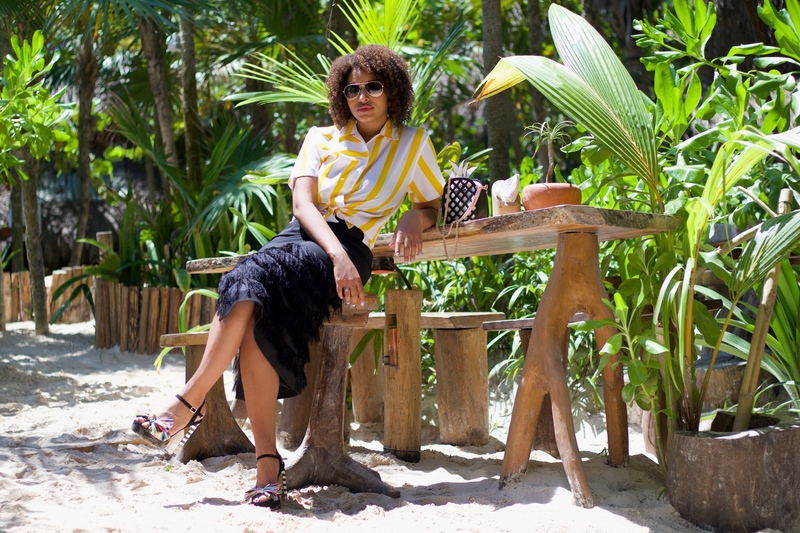 It is hot in Tulum, so tropical print and light fabrics were my go to options. I pack by color scheme and rich pastel colors made up most of my outfits. Icons Closet is the online boutique selling these fabulous floral pants with a skort like over lay. I styled them with a bandeau top and lace overlay, that just so happens to be a robe. Shop the pants here! On a daily basis I pretty much opted for color to go with the Mexican theme, wearing a striped white and yellow shirt with a black fringe skirt and multi colored sandals. Block heels are better, sand is not friendly to the traditional stiletto. Follow me on Instagram for shoppable outfits from this and my other vacation looks! If you’re into Raw food and a jungle like atmosphere, then stop by for fresh Ginger Beer, Coconut Juices, and food made with love. The natural décor and relaxed aura made this a great choice for breakfast, lunch and dinner. We snacked on a mushroom burger and living pizza. Since we are vegan (blogging this soon) we had to make sure we found restaurants that catered to our lifestyle and Wild had amazing Vegan options with a breathtaking ambiance. 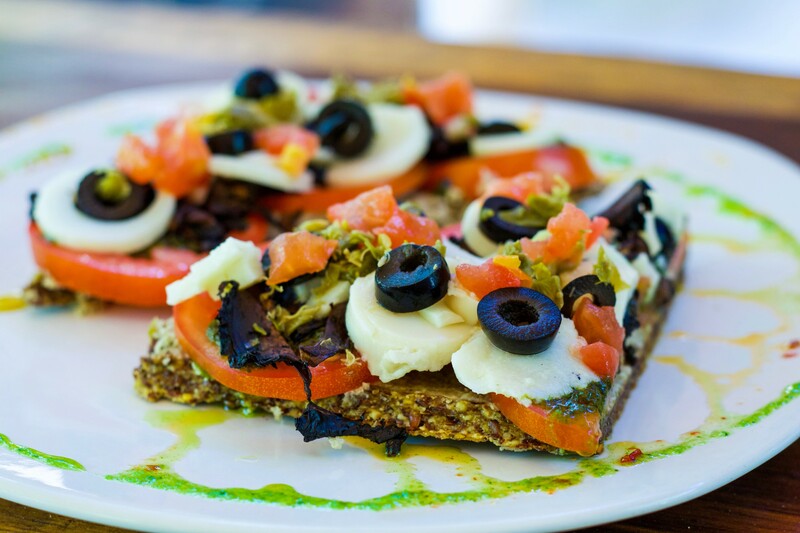 Come here for after beach snacks and enjoy quality crafted cocktails and hummus and pita chips that are to die for. 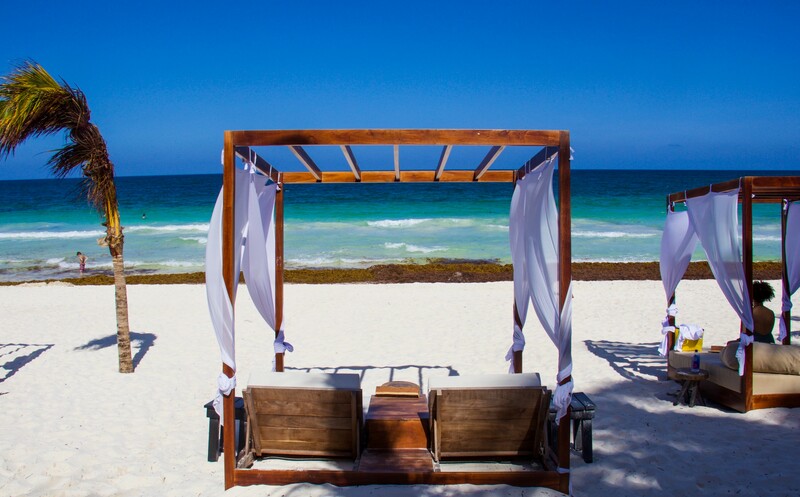 We relaxed at Los Amigos Beach Club in gorgeous cabanas while watching the waves and taking in the Tulum fresh air. There are many public beaches that you can visit if you aren’t staying at a beach front resort or one affiliated with a beach club. Most hotels are affiliated with beach clubs so be sure to check with your reservationist! 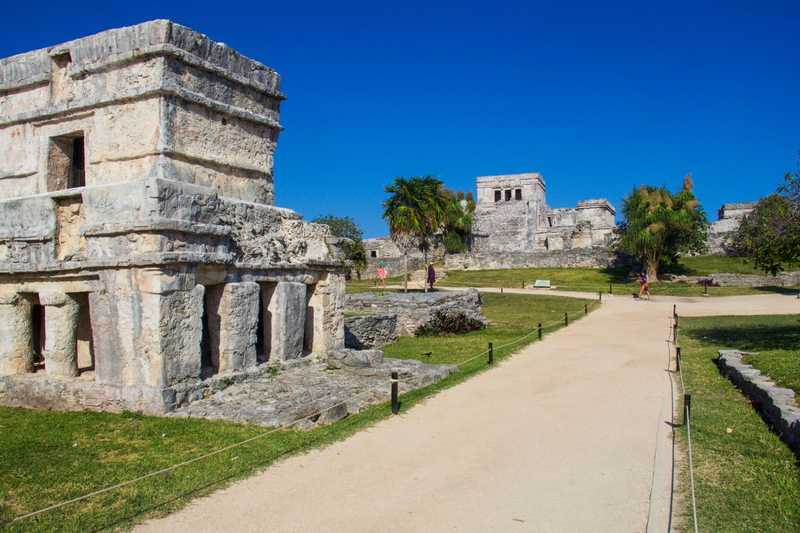 You can’t visit Tulum without taking a tour of the Mayan ruins. We specifically visited the Tulum Mayan Ruins, which are right off the coast of the Caribbean sea. Open all day from 8:00 AM – 4:30 PM (we just made it in around 3:45), grab a cheap ticket for less than $5 USD and make your way through Mexico’s rich history. The scenery is breathtaking and the animals around are quite friendly, to say the least. Don’t book in advance, it is half the price to book when you get there and a guide isn’t necessary! 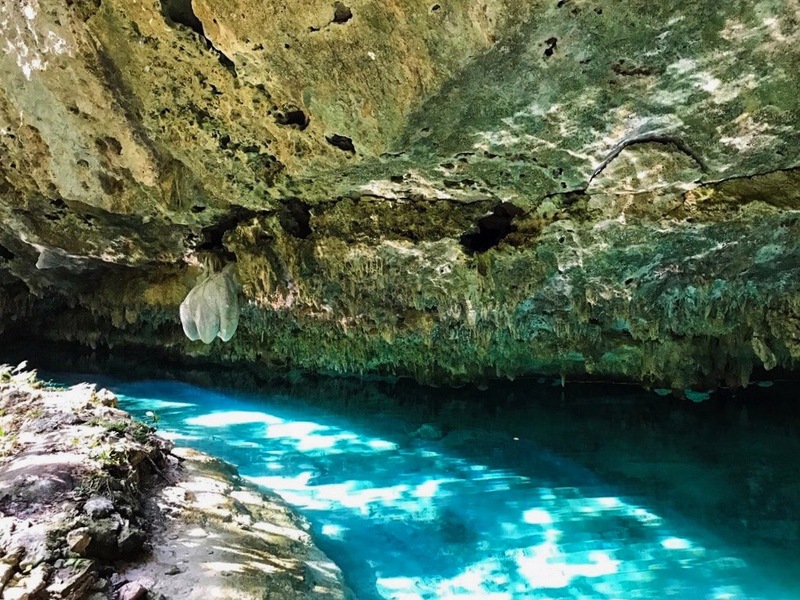 Make sure to take advantage of the Cenotes, underground caves and natural wells that are native to Central America. We literally swam through bats caves like the beginning of some scary movie. You’ll experience an unforgettable and up-close view of indigenous rock formations and wildlife. The cave we chose, Sac Actun, was found just 5 years ago by accident by a native who fell in and followed the sunlight on his way out. Talk about a trooper, the cave may not have been discovered it I were the native. There are so many Cenotes to see in Tulum that you can’t go wrong with any choice! Would you live on the wild side and visit the jungle town of Tulum, Mexico?